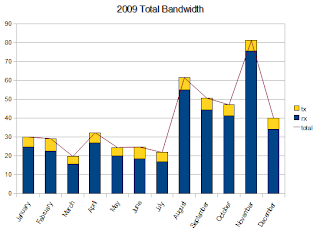 I thought it'd be fun to get a yearly total for bandwidth, since I had the numbers available. The total is less than two months' worth of data allowed by Comcast's 250GB/month cap. 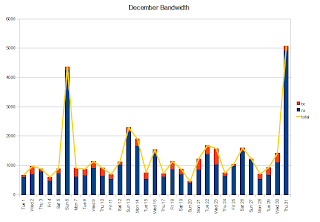 It looks like all the HD video streaming in November definitely had a noticeable effect, though. Numbers dropped way down this month, in no small part due to the lack of streaming a lot of HD movies on Netflix. In fact, one of the TV series I was watching had some episodes not available for streaming, and so I used my one-disc-at-a-time DVD plan to get the actual disc from Netflix. The end-of-year spike comes from something new. I have been getting a "Zune newsletter" in my email, either as a result of playing with the Zune software a while back or the change of the Xbox 360 music and video marketplace to use the Zune marketplace. In this newsletter, they mention the occasional free song or TV show episode to download, and I decided I'd go ahead and check it out. So, I installed the Zune software (which, while I've derided as a media player, is needed for marketplace browsing) and downloaded a few shows, like the Mythbusters holiday episode and a cartoon or two. I also checked out their podcast section, and I found not only the two podcasts from GeezerGamers.com (one of which I actually co-host) and a couple other gaming-related podcasts, but a handful of audio and video podcasts from my church! So I subscribed to a bunch of feeds, which downloaded a few extra bytes. I just hope I can find time to listen to them in addition to the audiobooks I get from my Audible.com subscription. I bought my wife an upgrade to Windows 7 for Christmas. There was a deal on the upgrade package to Windows 7 Professional when I placed the order for the laptop she was getting me. Now, according to what I've seen on the intertubes, and even according to the instructions that came with the upgrade, if you're upgrading from Windows XP, you have to do what amounts to a new installation, wiping out your existing XP software and creating a new Windows 7 system. However, if you're upgrading from Vista, you can do a simple in-place upgrade. Just click "Ok" a few times, and soon you'll have a working Windows 7 system, with all programs and software installed. Imagine our surprise, then, when the installation process moved forward a couple screens and then informed us that you cannot do an in-place upgrade from Vista Home Premium to Windows 7 Professional. Choking on this particular upgrade path doesn't even make sense to me. Isn't Professional supposed to be a superset of Home Premium? Why couldn't the upgrade disc add features that weren't there before? But choke it did, and now my wife is in the process of collecting the installation files and a list of all software she will need to reinstall, because Windows does not work as advertised or documented; Windows 7 will not upgrade in-place over Vista, if it is "uncomfortable" with the mix of flavors.